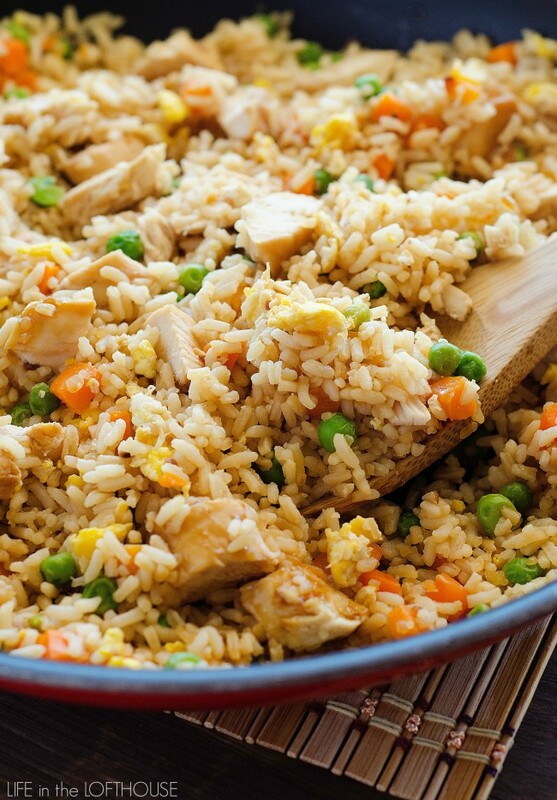 This Chicken Fried Rice recipe is a family-favorite of ours. 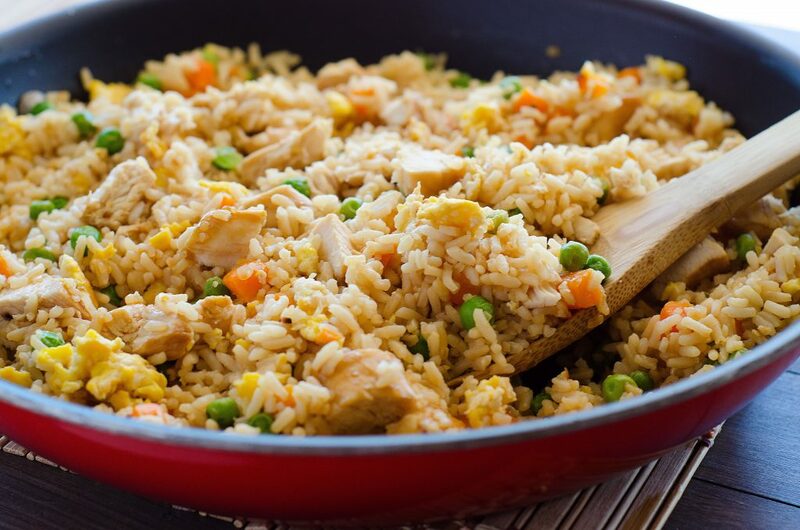 It has all the classic elements of fried rice with teriyaki chicken through out. Serve it with a vegetable to make it a complete and delicious meal! That chicken and rice has been a family-favorite for years. I make it all the time, especially for company because it is just so good! 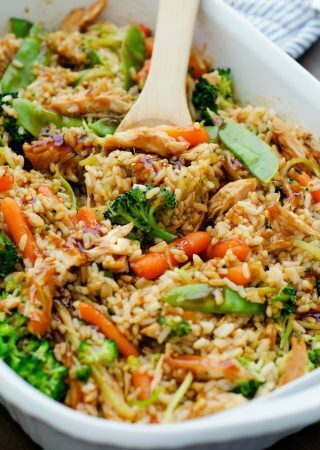 A couple years ago I made some teriyaki chicken in my crock pot, and decided to slice up the chicken and put it in the fried rice. It is so dang delicious, I thought it was time to share the recipe on the blog. It’s a cinch to make and not much different from the original. Hope you all enjoy this recipe. It’s a good one! It’s so funny you posted this as I was JUST thinking about doing this. You are right– I first came to your blog from the S&S chicken recipe about 5 years ago. I’ve made that dish several times (as well as many others you have posted), but it is a bit time consuming (though tasty!). So I thought, what if I just make the rice and add chicken, then BOOM! you posted this. Made it tonight. SUPER easy to make and tasty too. My 6yo son scarfed down two huge bowlfuls in 5 minutes flat. I would recommend adding in 1 more egg. It wasn’t enough for me. We also grilled the chicken– we live in Texas and it’s too hot to have the oven on. But otherwise a very tasty, easy weekday meal. Just made this! I did not have teriyaki sauce so I used soy sauce and added brown sugar and grated ginger. The chicken is to die for. So good. I am taking it to cocktails tonight. I tried a little first and it is scrumptious! Thanks for the recipe! When you say to use a bottle of teriyaki sauce on the chicken, am I really using an entire bottle? Haha, I’m new with cooking and need all the extra help I can get. What do you suggest pairing this with? 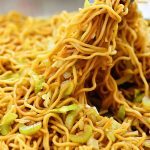 I struggle pairing Asian dishes! Thanks so much! I adore your blog and your recipes are great! Super helpful!!! Hello! 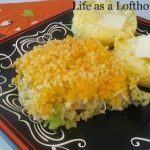 Very yummy recipe, my kids and hubby loved it! How much is in one serving? I found this recipe through Pinterest, of course. I whipped it up today and it is delicious!! Crazy easy. Thank you thank you!! What brand terayki sauce do you recommend ? I would like to know what teriyaki sauce to use too? Can I cook the chicken on low for longer? I would like to put it in before work. I made this tonight for my family, and it was hit! Even approved by my mother in law! Haha. I did make a few substitutions I used a teriyaki marinade with a pinch of pineapple juice and an extra egg. Great and easy recipe! Thanks!! I can’t rave enough about this recipe! I’ve never made fried rice at home, but this is waaaaay better than any restaurant. I made it for dinner last night and I’ve had it for breakfast and lunch today. If you like a little kick I suggest adding some sriracha. I also threw in some of the teriyaki sauce from the chicken yummy! When you say 3 cups cooked rice, is the yield of the rice 3 cups or 3 cups prior to cooking? You mean 3cups cooked rice don’t you? So it would be 1 1/2 cups raw rice to yield the 3 cups cooked? I used a cup of and a half of raw rice which comes out to about 3 cups of cooked rice. Three cups of raw rice would make an extreme amount of rice. I just finished a plate of this and boy was it delicious! Some may want to scale back on the soy at the end depending on your sodium preferences but I loved it. I only added one chicken. Breast because I paired this with general tso chicken that I made and this outshines that by far. Yum! 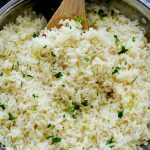 Can you use long grain white rice or does it need to be instant? You can use any rice. As long as it’s cooked first, then cooled in fridge. Cold rice works best. If it’s warm and fresh it will be mushy in this recipe. I don’t eat eggs is there anything I can substitute for the eggs please. And what can I serve this with. You can just leave the eggs out and don’t need to replace them. It will still taste great! 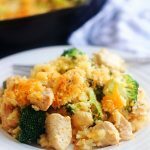 I like to serve this with a side of veggies- like steamed broccoli! If i cook the chicken in the oven how do i cook with the teriyaki sauce? Do you know how many calories this recipe is per serve? And how many serves you get out of it? 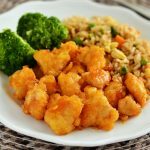 I have been making your sweet and sour chicken and fried rice recipes for about 3 years. I have changed cooking methods but nothing much otherwise. 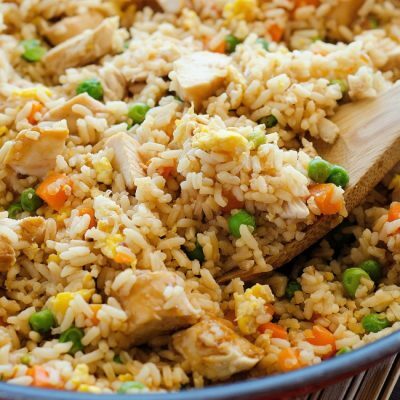 These recipes are so delicious that we have no desire to eat at a Chinese restaurant anymore. I make it frequently and it is always met with extreme excitement! Do you ever make this with beef? What do you do with left teriyaki after cooking chicken? 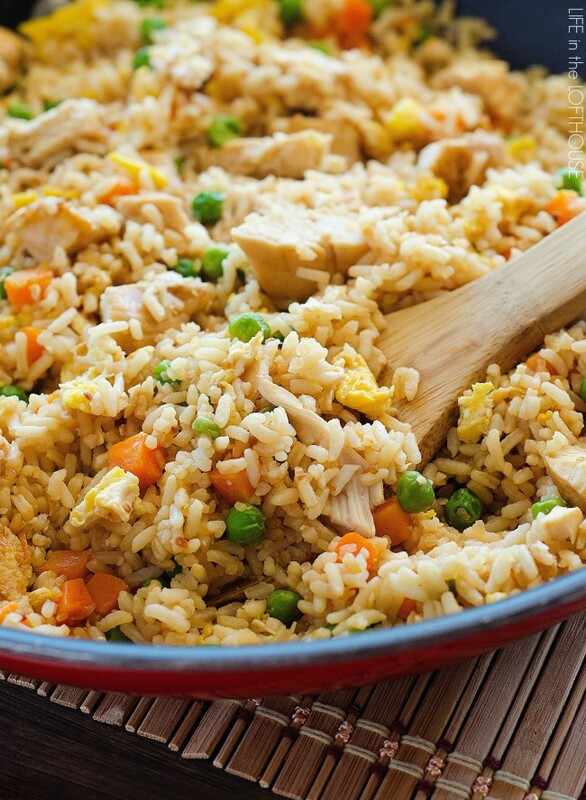 Do you drain the chicken after cooking, or do you need to include the extra teriyaki sauce in the rice mixture? I added the extra sauce into the rice mixture. The extra sauce made the dish very salty. Next time I’ll use less teriyaki sauce and drain the chicken. I did take the advice from another comment and added an extra egg. I used Brown rice and the texture was perfect. Can i use brown rice for the above recipe, will it turn out to be the same ? Does it really feed 6? 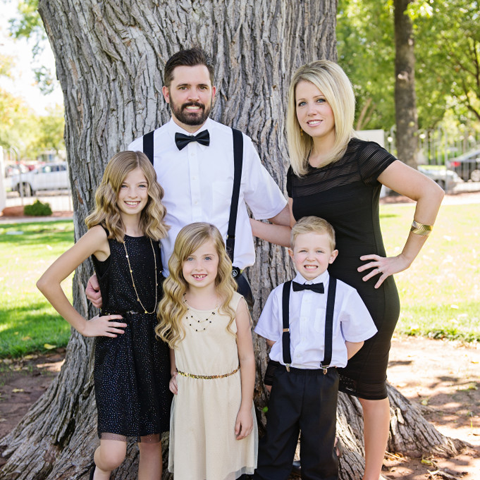 I have a family of 3 that eats like a family of 6. Sonif said serving for 3 I would normally double. But this says serves 6. So I should be good not doubling you think? Thanks in advance. I love this Chicken friend rice, it is better option as compare to KFC fried rice. Wow. This is a great recipe. I watched some people on TV eating chicken rice and suddenly needed it in my life. For a first try, this turned out perfectly and is SO delicious. I also love how the broth from the chicken is used to layer that flavour into multiple dinner components and the ginger garlic sauce-sublime. Even the rice was amazingly tasty! The only alterations I made were to throw in a red chilli and cilantro leaves into the soup broth which were strained out before serving and I used key limes (and I used a bit extra) in the spicy sauce. I will happily make this again. Thanks!